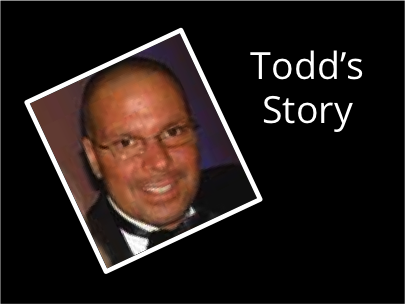 This story was written by Todd in September 2007. On Monday, February 12, 2007, I went into work and didn’t feel well. Later in the morning I had a seizure and was taken to Sarasota Memorial Hospital where it was discovered that I had a brain tumor. Upon having surgery to remove it on February 15th, the surgeon discovered that it was in fact a malignant tumor known as a grade III anaplastic astrocytoma. The doctors were not able to remove all of the tumor tissue since part of it was in the motor script region of the brain, which controls movement. As a result of the tumor’s location, following the surgery, I was paralyzed on my right side. Not only did I have to focus on the realization of having a brain tumor, but I also needed to focus on being able to move my right arm and leg once again. After hours of intense therapy and determination, my brain and my right side are once again functioning as one. Since not all of the tumor tissue was removed, following the surgery, I also went through radiation and chemotherapy. In just six short weeks, however, the tumor was growing back again. My doctors referred me to The Preston Robert Tisch Brain Tumor Center at Duke University Medical Center for treatment with Avastin®, an experimental brain cancer medicine. During the treatment, I would need to be at Duke every two weeks for a 30-minute infusion of the medication, and the treatment was expected to last 10-12 months. Despite several insurance appeals, we were not able to have the treatments approved. We decided to move forward with the treatment anyway. This decision meant I had to travel from Florida to North Carolina at least 24 times over the next year, and this was a significant cost for my family. Soon after the treatments at Duke University began, I received the incredible news that the tumor was GONE! All that remains is known as the “fingers” or bloody vessels that the tumor was attached to-and most recently, those also are dissipating. The swelling, which contributed to the seizures, is also GONE! Treatment will continue at Duke for the next year to ensure that the tumor does not try to rear its ugly head again. Without the support of Lazarex Cancer Foundation, I would not only be focusing on my health, but on the financial hardships. I am forever grateful for the support Lazarex Cancer Foundation has given to my family. It is not an easy position to be sitting in. To be the one in need is a very humbling experience. My family and I feel so incredibly blessed to have found the Lazarex Cancer Foundation and to try and put our thanks into words is very difficult. The generosity of Lazarex Cancer Foundation has helped alleviate much of the financial stress we have been facing as a result of compounding medical bills and travel expenses.